Why Choose Us for X-ray Foreign Material Inspection? For starters, we’re fast. If you suspect or know you have a foreign contaminant issue, we can help today. We’re cost-effective. Our fees amount to a small portion of your production costs. We have the capacity. With more than 15 inspection lines operating 24/7, we can handle any project — large or small. We can often inspect an entire truckload in as little as three to four hours, while the driver waits. We have the best technology. FlexXray can detect metal, glass particles, stones, bone, rubber, plastic, gasket material, product clumps, container defects, wood and missing components down to 0.8mm or smaller. We trace everything. FlexXray maintains full traceability throughout the process including pallet, batch/lot codes and temperature. We’re near you. FlexXray is located throughout the continental United States to conveniently serve clients across North America. We also offer mobile inspections and X-ray rentals. Still not convinced? See more reasons why more than 800 customers throughout the United States choose FlexXray. Your product is on its way! 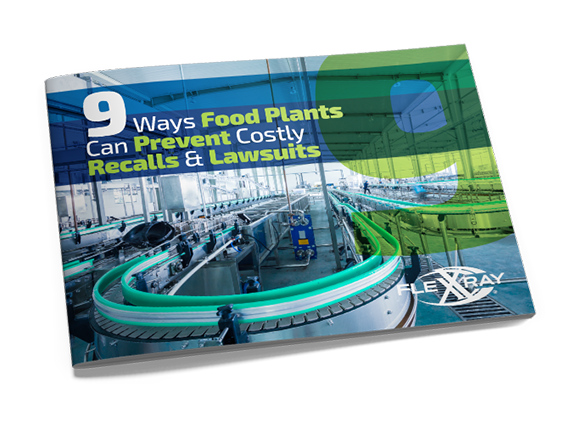 FlexXray provides X-ray food inspection to help food companies minimize risk and prevent expensive recalls and lawsuits. Our services can help you save money, cut waste, eliminate out-of-stocks and help protect your reputation as a food provider.